Ready for your next trade show? If you’ve exhibited at a trade show before and want to increase your impact on the next event, creating a customized booth for your business is one of the most effective tactics available. However, there’s much more to designing a great trade show booth than just adding your brand name and logo to a display. From graphics to lighting, a variety of elements combine to make a trade show booth stand out from the crowd and produce a real impact. Below, we’ve listed five essential elements to include in your custom trade show display for the biggest impact at your next event. If you’re investing in a custom booth for your next convention, make sure all five are on your “to include” list. Graphics are essential for an effective trade show booth. In fact, the more your graphics stand out from the crowd and communicate your message, the more effective your booth will be as a sales and marketing tool. When it comes to booth graphics, there are three rules to keep in mind. The first is to stand out from the crowd by being distinct and unique. The second is to prioritize readability and keep clutter to a minimum. Finally, it’s important to keep your graphics consistent. Use the same typefaces and colors for every part of your booth and you’ll attract positive attention from attendees, the kind of attention that your sales team can convert into leads, prospects, and sales. It should go without saying, but social media information is essential for any effective trade show booth. While many attendees will be happy with a business card, others will want to follow your brand on Facebook, Instagram, Twitter and other platforms. Incorporate your social media usernames and URLs into your booth and you’ll make it easier for visitors to follow you online, tag your brand in event photos and drive traffic to your social media presence once the event is over. Trade shows are busy, crowded and competitive environments. One easy way to stand out from the competition is to give away interesting, high-quality promotional items such as t-shirts, pens, coffee cups, and notepads. The key to a great promotional item is simple – keep it useful. A good notepad or ballpoint pen can easily find its way into a prospect’s office for months and years to come, giving you a great supply of leads and potential deals from previous trade shows. 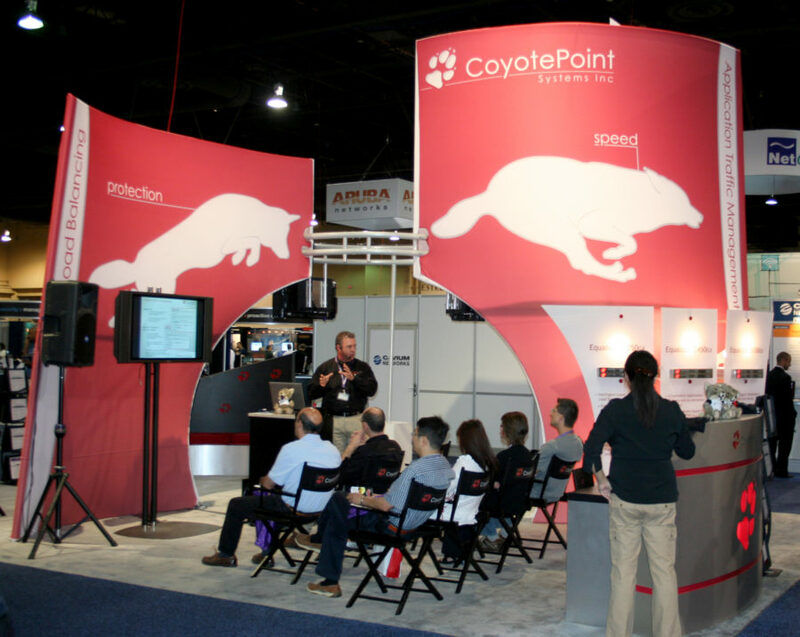 While product demos aren’t strictly a design element, they’re a great tool for earning attention at any trade show and keeping visitors there for a duration of time. As such, it’s worth incorporating a product demonstration area into your custom trade show booth, especially if you have interesting products to show off. There are several key points to keep in mind when designing a product demo area. The first is visibility as attendees need to be able to see your product demo, preferably from a distance, in order to become involved in your booth. If electricity is available using a flat screen computer to show 3D models or other demos that users can see and draw an experience from to make your brand truly memorable. The second is space as even the smallest product needs space to be showcased, especially if your goal is to attract a crowd. Provide a large, comfortable and visible area for product demos and when combined with a good product, you’ll have no problem attracting people to your booth. Finally, one of the most important design elements of any successful trade show booth is also one of the most frequently ignored. Good lighting can make or break your booth, providing an extra edge in style and visibility for your business. People are naturally attracted to brightly lit, highly visible exhibits. Illuminate your booth with a warm, clear source of light (preferably both upward and downward-pointing spotlights, for visibility and dramatic effect) and you’ll notice that it naturally becomes more interesting and attractive. As well as attracting attention, the right lighting can make a small trade show booth feel larger and more expansive. Try using directional lighting to highlight the “depth” of your exhibit, or to draw people’s attention to specific products, displays or promotional offers.